There are many children in Kabwe whose guardians and parents are so poor that it is impossible to send the children to school. The children are keen to learn but have little or no opportunity to excel. 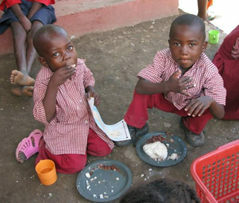 An opportunity has come up for BHW to become involved in assisting more than 120 children in Kabwe to go to school. For a number of years BHW has been in partnership with OM Zambia / Pro Christo (ZAM13). During 2007 Pro Christo, in partnership with Grace Church, started working with two community schools in Kabwe to create a whole new environment. BHW loves the vision and is keen to assist with some support. The voluntary teachers at the school will benefit from regular salaries and also good training and support. This was not in place prior to the intervention of Pro Christo. The beneficiaries will be the very poor children of the suburb of Nakoli in Kabwe. The guardians of the children will also benefit from their children attending school. Indirectly the community will benefit as the children's lives are transformed. The intentional spiritual environment that is being created. The vision is to establish learning institutions that will train the hearts and transform the minds of its children and parents. They plan to do this through providing excellent education aimed to reach the whole child. This will be achieved through dedicated, Spirit-filled teachers who will take up their role as agents of Godly change within the classroom and the community. School administration was virtually non-existent and along with the curriculum is being completely overhauled. Teacher training is a priority and ongoing training and mentoring is being put in place. Visitation of the parents and guardians and assessment of the needs of the community will be an ongoing activity. There is need for a social and health worker to address the manifold needs of the children. A daily feeding scheme is an essential part of the strategy. A Teacher Training College was commenced in January 2008 where community teachers are being trained and equipped to effectively run and administrate their schools. It is expected that this training institution will bring hope to hundreds of untrained teachers in Zambia and beyond who dedicate their lives to bring education to thousands of less privileged children. The strategies are developed and implemented by the Pro Christo leadership team in conjunction with Grace Church in whose buildings the school operates. 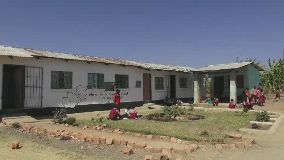 In 2009 BHW funded Pro Christo Ministries to build a commerical flat that has been rented out as an income generating activity for the school. It currently helps to fund over 50% of the financial requirements for the school, reducing the amount needed from BHW. The annual budget for this partnership will be used for school operating costs, teaching materials, text books, uniforms, food and teachers salaries. “I teach the Grade one class, the ages range from 6 – 13 years. Some of the children are double orphan and stay with their grandparents. That’s why they don’t start school at an early age. A lot of the grandparents don’t have employment so rely on small scale agriculture to survive. Guardians take the children to the fields to work instead of allowing them to go to school. In mid 2017 the Zambian government began a process of phasing out community schools in an attempt to raise quality of education and appointed a head teacher and also a new deputy at Nakoli. OM felt this compromised their vision as they now had little control over lesson content or class sizes, which have risen to undesirable levels. As a result, in early 2018 OM Zambia made the decision to step out of Nakoli school. This will not be with immediate effect, but over the next year or so they will be withdrawing their teachers. Funding of the feeding program will cease. Because of this ongoing financial support from BHW is no longer required.